Dirty Words: Were the 50's Better? So the days of yore are remembered with nostalgia, with fondness for the days gone by. HOWEVER...I take one look at a picture like this and I have to wonder: what the hell kind of days were they? Just what are those two boys planning on doing with that unsuspecting maiden...or do those two boys have a plan in place whereby they'll protect their innocence after that tartlet has fed them all that fried food and carbo-loaded them? Didn't Coke (tm!) used to contain actual cocaine? I might be offering that urban legend up as fact, but it's Tuesday and I don't concern myelf with FACTS on Tuesdays. I'm sticking with the cocaine story and proposing that these three are in a world of trouble once those cold, refreshing Cokes kick in. Why were the people of the 1950's so slim and trim anyway? 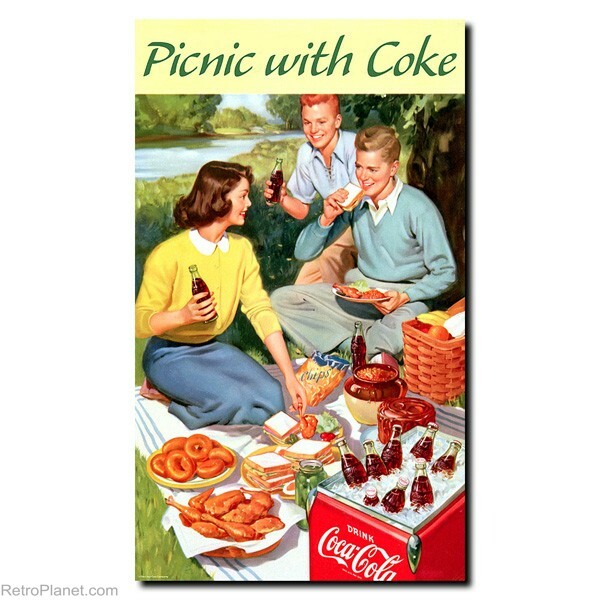 Look at that picnic! My word, that's gotta be a 3,500 calorie lunch! Bob and Jillian would be very troubled by that recreational lunch. I'm outing the 1950's as an era of depravity. The next time you see your grandparents, I hope you'll think back fondly to this day and realize that they were the pioneers of tosh.0 and have no one to blame but themselves for sexting and tramp stamps!